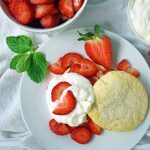 The Best Strawberry Shortcake with Homemade Sweet Biscuits, Sliced Strawberries, and Sweetened Whipped Cream. We just spent our Spring Break in the South. We fell in love with a tiny island, called Hilton Head, back in 2011 when we took a 10-day road trip from Texas to South Carolina. The tall pine trees set in a white sand beach town was unlike anything we had seen before. The beachfront resorts, warm waters, and Southern charm made us lifelong fans. We have always dreamt of going back. This was our chance. We flew into Atlanta, spent one night there, and then drove to Hilton Head to stay for seven nights. We took day trips to charming cities full of historical significance — Savannah, Georgia, and Charleston, South Carolina. It was oozing with all things Southern and we partook of a ridiculous amount of biscuits in the process. One night as we were hanging in the hot tub together as a family and the very important subject of FOOD came up. We started discussing our ultimate desserts. This was very difficult to narrow it down to one, two, or three favorites. 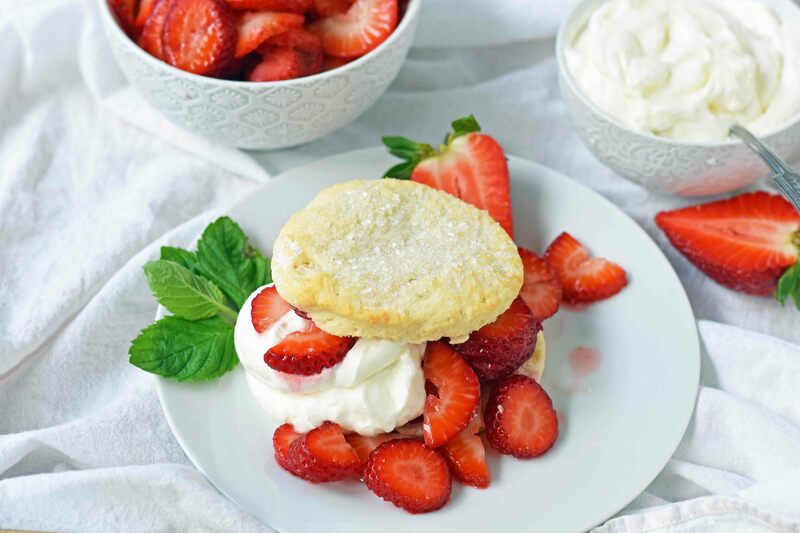 One of my husband’s hands-down favorite dessert is strawberry shortcake with sweet biscuits. 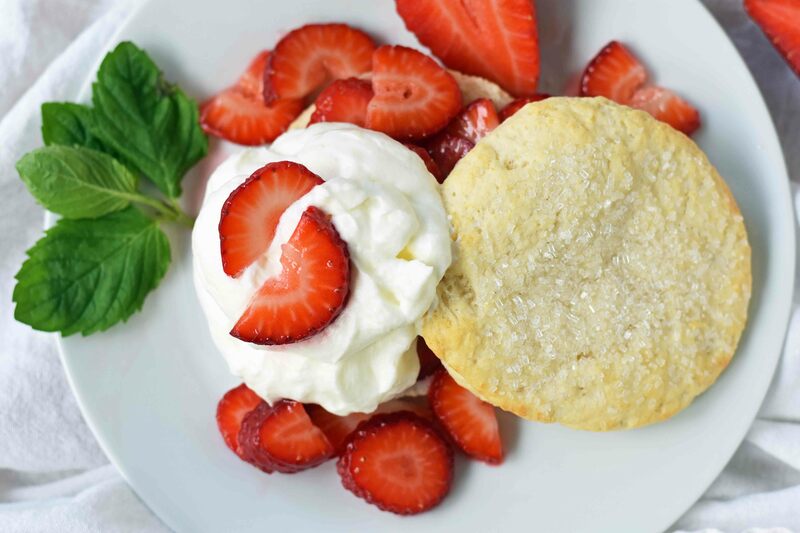 It was on the menu everywhere in the South and I couldn’t believe it when I realized that I had not shared our easy Strawberry Shortcake recipe on Modern Honey. It’s downright heavenly! There are many opinions on strawberry shortcake dessert. Some people love it with angel food cake. Sorry, you ain’t getting that recipe here. 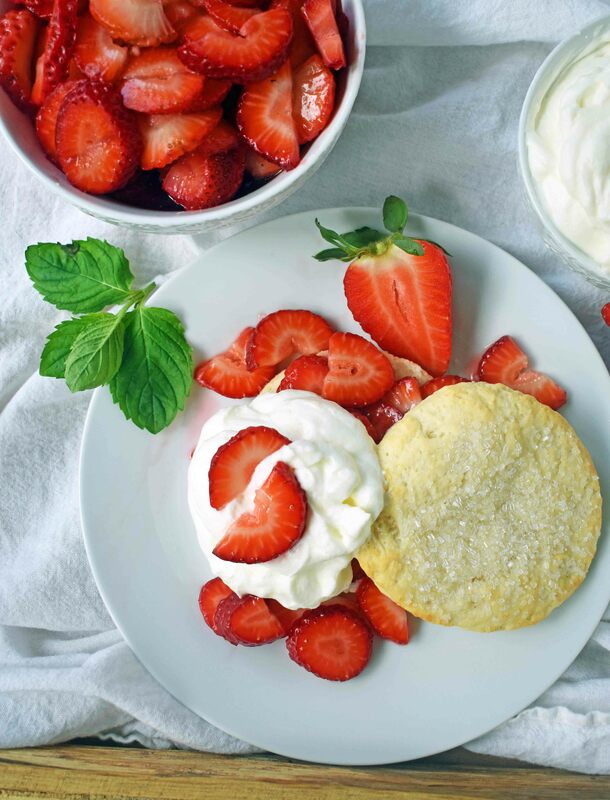 My husband grew up with a Mom who made strawberry shortcake with homemade biscuits. Once we got married, I tasted strawberry shortcake with sweet cream biscuits and have been hooked ever since. Biscuits all the way! Whenever I travel, I can’t wait to get home to start cooking in my kitchen again. I miss it so much while I am gone. One of the first things I couldn’t wait to bake was homemade biscuits. After eating so many in the South, I wanted to hone my skills in the kitchen and see how mine stacked up. Of course, this meant making them a tad sweet and making homemade strawberry shortcake for my honey. Start with Homemade Biscuits. This sweet biscuit is made with a combination of sweet cream butter, cream cheese, and either whole milk or buttermilk. This gives it a creamy flakiness that pairs beautifully with sugared strawberries and handcrafted whipped cream. 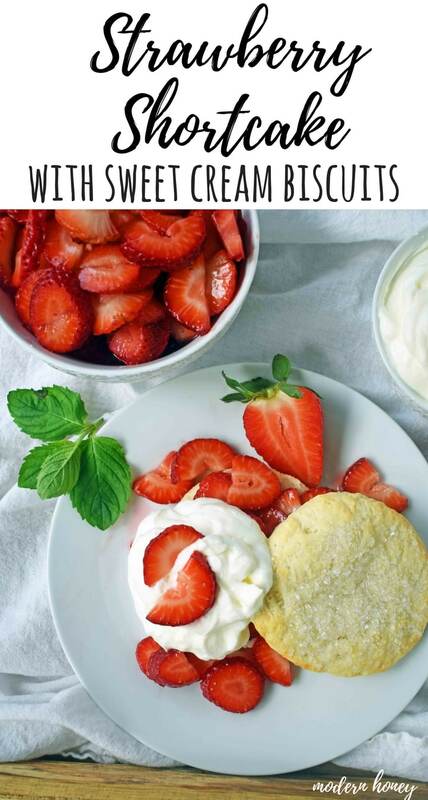 Slice the biscuits in half and stuff with strawberries and cream. A sprinkle of sugar on the top of the biscuits, before baking, puts it over the top. Sugar those Strawberries. Place the sliced strawberries in a bowl and sprinkle with sugar. Set aside and let the sugar do its thing. The sugar brings out the natural juices in the strawberries and it creates a syrupy sauce. The biscuits soak it up and it makes them very happy. They told me. Whip that Cream. There’s nothing like homemade whipped cream. Sure you can cut corners and grab Redi Whip at the grocery store because that’s delicious too but if you want it to be REALLY good, make your own. Trust me on this one. RUN to the store and pick up a carton or bottle of heavy whipping cream and whip that goodness until soft peaks form. Stir in powdered sugar, until you are super happy with the sweetness ratio. 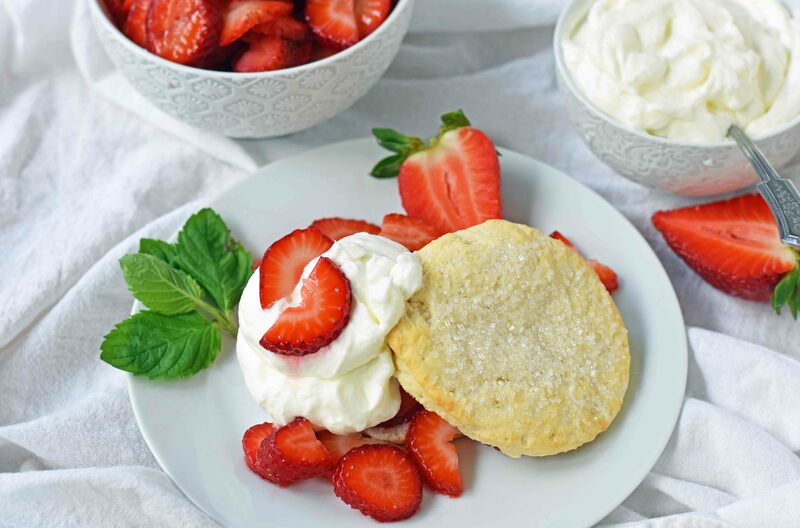 Here are the utensils used to make the Best Strawberry Shortcake — Silpat baking mat or Parchment Paper, Light Colored Baking Sheet , Pastry Cutter, Sparkling Sugar, and Round Biscuit Cutter. This is the BEST STRAWBERRY SHORTCAKE RECIPE. Just sayin’. In a medium bowl, add flour, baking powder, baking soda, sugar, and salt. Add cream cheese and grated butter. Mix with a pastry blender, fork, or mixer. Once most of it is incorporated, pour in whole milk or buttermilk. Dust countertop or a large cutting board with flour. Roll biscuit dough until 1/2 inch thick. Cut out rounds using a sharp 3-inch round cutter. Place the biscuits on Silpat-lined or parchment lined baking sheet. Sprinkle biscuits with sparkling sugar or granulated sugar. Bake for 10 - 14 minutes or until a light golden color. Set aside. Place sliced strawberries in a small bowl and stir in sugar. Place in refrigerator until ready to use. To make whipped cream: beat the heavy cream until soft peaks form. Stir in powdered sugar and beat just until combined. 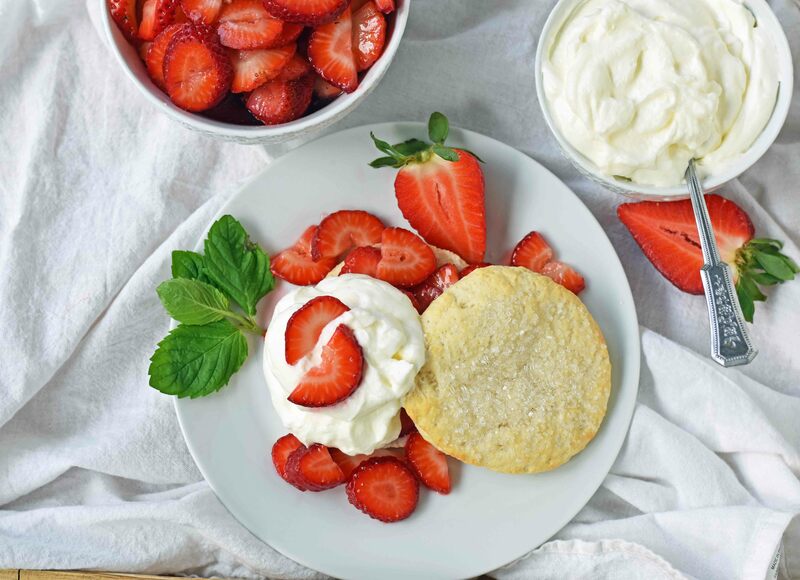 To assemble strawberry shortcake: split open the biscuits. Top bottom half with sugared strawberries. Top with whipped cream and top of the biscuit. May make double-layer biscuits. Spoon strawberry juices over strawberry shortcake and serve. Being a born and raised southern girl I have to tell you that sweet blueberries and REALLY ripe, sliced peaches are equally yummers!! The fruit is better if you let it sit in the fridge several hours or overnight.